There is something magical between a struggling girl and a horse. Horsemanship is used to soften girl’s hearts, teaching them relational skills. – Christian military schools and reform schools. The horsemanship program at Re-Creation Retreat involves equine-assisted therapy and practical horsemanship skills taught by experts utilizing effect therapeutic interventions. There is no denying the fact that troubled girls respond well to horses. There is something magical between a struggling girl and a horse. At Re-Creation Retreat horsemanship is used to soften our girl’s hearts and to teach them the practical application of relational skills that matter. Girls in our horsemanship program build powerful relationships with the horses, thus learning key relational skills and tools that translate to healthy relationships with peers, parents, and authority figures. Horses are very unique and they can read people better than people read one another. Our therapists use the experience between the girl and the horse to find new ways to provide powerful therapeutic intervention. Our therapists use the interaction between the girl and the horse to become self-aware of the issues that cause stagnation and confusion. The truth is that you can’t fool a horse. A horse is either going to trust you or not trust you, based on your authenticity and genuineness. You simply can’t “front” with a horse, nor can you be fake, demanding, or coercive. Basically, you can’t con or trick a horse, and manipulation doesn’t work either. 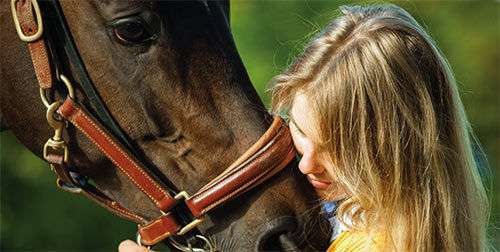 Horses are capable of unconditional acceptance, and they are loving creatures with real emotions. Girls at Re-Creation learn about relationships in a safe place through our horsemanship program. Our girls take care of the horses at a level that allows them to build strong and healthy relationships with loving animals. 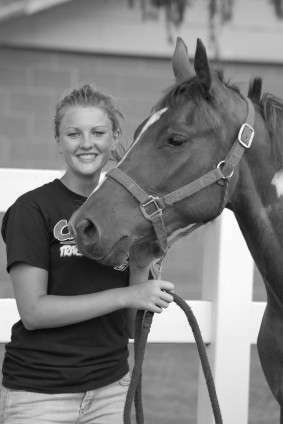 We have a equine-assisted therapy program that is designed to deliver clear objectives. Our girls start out by learning how to be safe around horses. Then they learn the basics of the horses body and personalities so that they can learn to properly care for the horses. Only after they have learned the basics and are safe can our students move on to developing riding skills, both in the arena and out on the trail. Through the interaction with the horses our girls work with the therapist to “process” their experience; the therapist is able to generate extremely valuable therapeutic insights and understanding that can translate to emotional and behavioral growth. The horsemanship program, along with equine-assisted therapy, our girls to learn the value of patience and the need to be focused, connected, and committed to others in order to develop meaningful relationship. Our girls experience “self-discovery” in regard to relationships; they learn how their thoughts, feelings, and actions affect others close to them. Our students learn all about themselves and become self-aware of how they show up in the world. Working with horse often leads to the strengthening our girls’ communication skills. Moreover, they improve their decision-making abilities, and become solid in their judgments as it pertains to relationships. Our horsemanship program is designed to help the girls develop and increase self-awareness and leadership skills while learning to be responsible for themselves and others. All of the skills that are acquired in the horsemanship program can be applied to developing healthier relationships with people. Thus, our girls become “other’s-centered”, making positive contributions to themselves, their family, and peers. We can also help you in your search for other affordable boarding schools, therapeutic schools, boarding schools, troubled youth ranches or residential schools. Re-Creation Retreat is a therapeutic boarding school for troubled teenage girls offering teen counseling for girls with adoption issues (reactive attachment disorders), self-harm (self-mutilation) or cutting, or eating disorders (anorexia, bulimia, anorexia nervosa). Other behavioral issues we deal with include: depression, post traumatic stress and anxiety. If you have an out of control girl, please consider this school for troubled girls that offers teen counseling and teen counselors for troubled girls. We offer counseling for troubled teens and out of control teens. We especially work with RAD girls and troubled girls who are adopted. Homes for troubled teens and boarding schools for teens don’t typically offer teen counseling and therapy, but we do. Among the best therapeutic schools with counseling – also referred to as “schools for troubled teens”. There is something magical between a struggling girl and a horse. Horsemanship is used to soften girl’s hearts, teaching them relational skills.